Hello there folks! 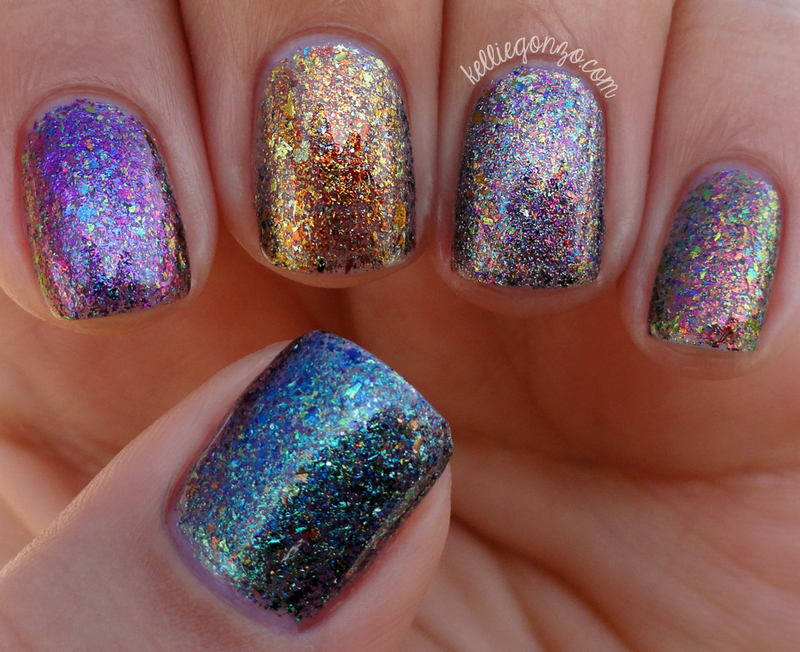 Today I have some awesome new indie polishes to show you, GlitterDaze's The Mythical collection. These polishes are special because they are multichrome metallic flakies! This type of new flakie seems to be a budding trend for lots of indie polish brands right now, but these ones are different than a lot of the others I've seen. They're not just one color of multichrome, they are made up of fine particles of flakes in different mixes of shades so they create their own unique color shifting effect, if that makes any sense. Let's take a look! On my thumb is Moonlit Mermaid, a primarily blue mix of flakes that shift to aqua, green, gold and purple. My pointer is wearing Essence of a Unicorn, which is mainly a red toned purple with flakes in green, blue, and gold. I have Interstellar Dragon on my middle finger which is a gold mix that includes copper, bronze, and shades of green. Forbidden Fairy Dust is on my ring finger, it's a total mix of rainbow in seemingly finer particles than the others, and it has the addition of holographic microglitter. And last, on my pinky I have Nymphomaniac, a mix of pink, green, gold and teal. Here is a shade photo so you can see how they look in lower lights. It was basically impossible to show their true amazingness, but you get a glimpse here I think. I've shown all of these at five coats; they are technically meant to be toppers, but I wanted to show you how they look by themselves on the nail to see the overall color effect. Forbidden Fairy Dust was the most opaque, I would say Interstellar Dragon was the least. One of the gals I watch on YouTube, Jessface90, did a video review of these that is really great and she does live swatches of them! You should watch it HERE. 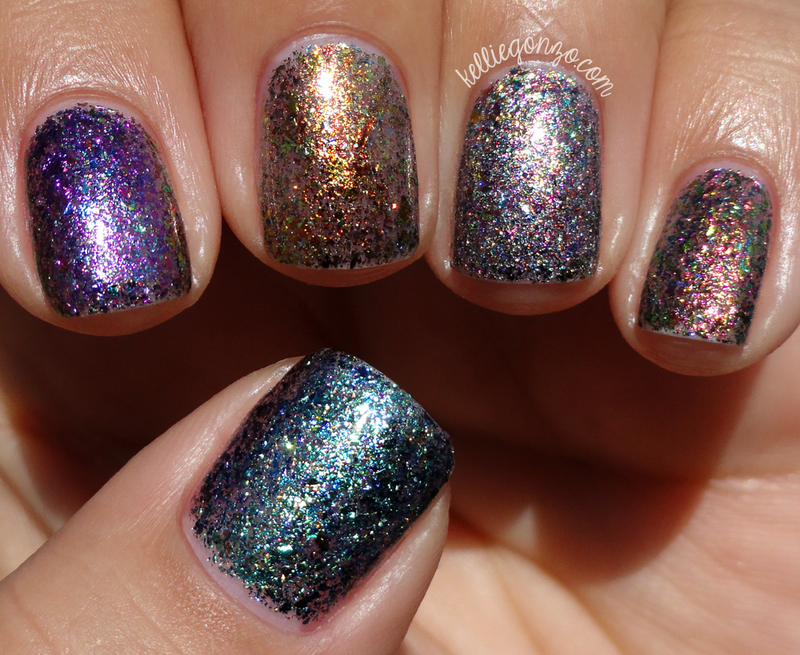 These are quite easy to apply and would look good over a variety of colors, not just dark colors like iridescent flakies. Or you can wear them by themselves as I have shown you here. If I had to pick a favorite, it'd be Nymphomaniac, though that name is my least favorite haha. This collection is available on the www.ShopGlitterDaze.com right now for $12.50 per bottle. These are really cool and the possibilities on how to wear them are endless! What do you think of them? Have you tried any multichrome metallic flakie polishes yet? I'm glad you came by today!